The HCl index is an indicator of the tannin polymerisation state and provides an indication of how these develop over time. The evolution during the micro-oxygenation of tannins involves an increase in their volume and this index tends to decrease during this phase while it decreases more significantly after fining or during ageing. The CDR WineLab®method optimises the reference method (Ribéreau-Gayon and Stonestreet) both from the point of view of ease of use and repeatability The standard deviation, in fact, ranges from 4.6 of the reference method to 2.5 of the CDR WineLab® method. The determination of the HCl index is part of a broad analysis panel developed by the CDR laboratories, implemented on CDR WineLab®, which offers the oenologist a precise and accurate control of both the polyphenolic extraction phase in red wines (maceration), of the subsequent polyphenolic stabilisation phase (and therefore of the colour stabilisation) that occurs with the micro-oxygenation process. the analysis involves a sample incubation time of 7 hours. 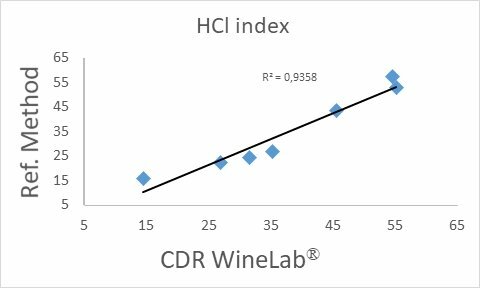 The correlation curve of the determination of the HCl index in wine with CDR WineLab®, carried out with respect to the Ribéreau-Gayon and Stonestreet reference method. This index is based on the instability of procyanidins, catechin oligomers, in a highly acidic environment. In conditions of high acidity these molecules tend to polymerise, forming brown polymers. The most condensed molecules precipitate rapidly while the least condensed tannins remain in solution. HCl Index was last modified: February 25th, 2019 by CDR s.r.l.